Joe Morton as the Brother from another planet. I suspect that many will be discouraged to watch Brother From Another Planet simply because of the movie’s premise and title. Hell, that’s mostly what I go on when deciding what movie to watch. But I took a chance on this one and I wasn’t disappointed at all. 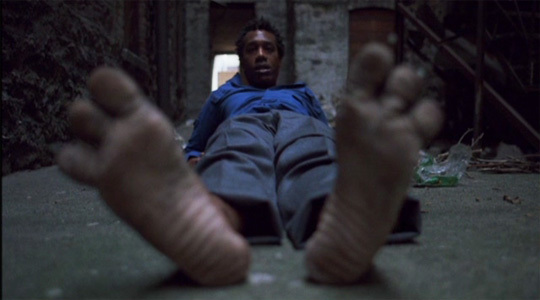 Joe Morton plays The Brother, who is essentially a walking metaphor. That much you can pick up on from about ten minutes in. The Brother looks like your average black man, but comes from outer-space. He’s dressed in rags and roams the city, not quite sure what to do. Now, this is a hard act for Morton. He’s the good guy here and despite his stoic nature, you learn to like him. His character doesn’t say a single word throughout the entire film. Instead, his emotions are displayed solely through actions. Can you think of a more challenging character to play than that? I should think not. The rest of the plot doesn’t concern much else. We follow The Brother as he adjusts to modern American life and human sin. He starts out by being looked down on by society but slowly becomes more Messiah-like. What is it exactly that he represents? Does he represent the slavery of the African-American race? Or does he literally represent an alien, in the most terrestrial sense of the word? I didn’t have many problems with Brother From Another Planet. The camerawork was nice and it had a handful of great scenes. The biggest fault I could find was that it got a little bit more preposterous as it went along, but that’s not that big of a deal. By the way, did you know that John Sayles financed this movie with his MacArthur Fellows ‘genius’ grant? Did you know that he was one of a very few to be selected for that award? I sure didn’t and I find that to be pretty impressive. Brother From Another Planet uses many themes and motifs to get its point across. Most of them deal with The Brother and his quest. He becomes involved with the trials and tribulations that most other humans face. He is faced with the epitome of human desecration: drugs. How does he react to them? He tries them, sees how harmful they can be, and tries to put a stop to them. Brother From Another Planet is not an important film or one that should even be sought out. But it’s clever, well-made, and well-written, and if you have the time to watch a good movie, you’ve got my recommendation.